Last night, Google announced Google Hotpot. 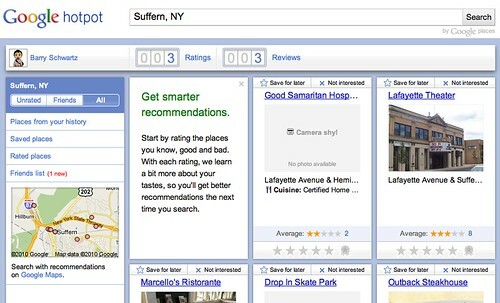 Google Hotpot is a local recommendations engine powered by you and your friends. The concept is simple, you and your friends rate stuff and when you search for local items on Google Places (Hotspot) you will be recommended places based on you and your friends likes and dislikes. On its own, Hotpot isn't necessarily that different than what's available elsewhere (such as on Urban Spoon, Yelp, and Facebook). But as part of a larger social and local combination (the pieces of which Google mostly has already), it could be very compelling. Particularly if Google partnered with someone like Foursquare, Google could vastly improve their personalization by not just what you search for, but by what you actually like. We'll have to watch and see if they can fulfill on this promise. Previous story: Are Google'sOne Box Results Unethical?